Dreaming of those Alabama skies where the starts are so thick that it's bright as day. 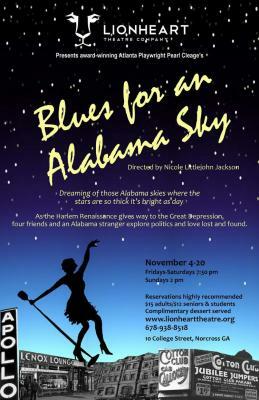 As the Harlem Renaissance gives way to the Great Depression, four friends and an Alabama stranger explore politics and love lost and found. Pearl Cleage's "Blues for an Alabama Sky" is a well-constructed play centering on Angel, a Depression-era Harlem chanteuse who is staying with a gay friend following a breakup with her Italian gangster boyfriend. The set shows their apartment stage left, neighbor Delia's apartment stage right, with a hallway center stage and the street outside far downstage. As usual, it's a very good use of the space in Lionheart Theatre Company's performance area. The set, designed by Linda L. Bruner and director Nicole Littlejohn Jackson, is attractive and functional. The set dressing makes it clear that stage left is inhabited by a dress designer who idolizes Josephine Baker, while stage right is inhabited by someone with simpler tastes. A window far left gives a feel of the view to the street and is used for some very effective blocking. Director Nicole Littlejohn Jackson's blocking is superior throughout. Sightlines are good, and the somewhat crowded apartment stage left maintains a good flow from scene to scene. I would have preferred some miming of an outside door when actors enter or leave the raised stage, but that's a minor quibble. Performances are good overall. Roderick E. Jackson, as Doc (Sam), betrays his inexperience onstage by shifting from foot to foot a bit too much, but otherwise makes a stunning acting debut. Dennis Bayne, as gay friend Guy, has all the movements of his character down to a "T," but has some fairly severe diction problems. Roger Ferrier, as Leland, isn't really enough of a hunky Alabama rube to spark the reactions he gets from Angel and Guy, but he nevertheless provides enough of a contrast to prove effective in his role. The women are the standouts in the cast. Shannon Mayers is an absolute delight as neighbor Delia, letting shyness and enthusiasm fill her character of an innocent social worker whose broad smile can brighten the stage. Isa J. Miles is convincing and bewitching as Angel, a character who is said to look better in other people's clothes than do the owners. That is clearly the case with a modest shirtwaist dress Leland gives her. When we see it lifted out of the box, it looks dowdy and totally unbefitting to the elegant Angel. When we see it on her, it's smart and sophisticated, with rolled cuffs, a V neckline, and a belt. Then, after Leland has complained, we see it buttoned up and beltless, toning down the natural vivacity of Angel (and of Ms. Miles). Costumes, by Kathy Releford, Linda L. Bruner, and Deanna Shankle, are splendid. They form an essential part of the story and they do not disappoint. Sound and lights also add to the effectiveness of the production. Director Nicole Littlejohn Jackson and producer Tanya Caldwell have done a very good job of pulling together all the elements necessary to create a very successful production. The major missing ingredient is pace. The action proceeds at a fairly constant speed, when it could use more variety, with occasional moments of giddy speed.